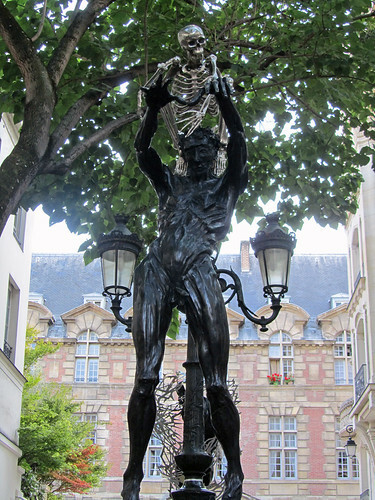 Just when I thought the sculptures by Daniel Hourdé around St-Germain have been removed (given the main period of exhibition in the quarter should be over), I stumbled across a couple more today at rue de Furstemberg, just outside of Musée National Eugène Delacroix. Not that I am complaining. The more I stumbled across his sculptures, the more I admire his body of works. I don’t know how to explain it, but there is a certain evocation of power and strength beneath every movement of the sculptures, accompanied by an expectation for the fluid movement to be extended and continued. I half expect to see them to come alive before my very eyes. And coming alive gracefully they will. Ps: the title of this sculpture means blind man’s bluff. And behind this statue, you could see another sculpture. That’s Les epines de la volupté (the thorns of lust). lol… i suppose, since it is quite life like.